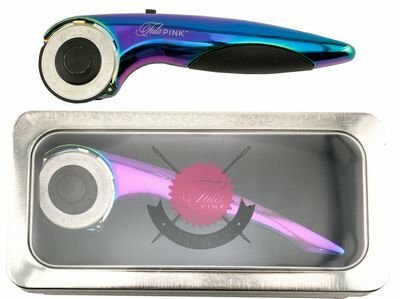 Tula Pink 45MM Ergonomic Rotary Cutter. Beautifully styled aluminum ally rotary cutter is designed for both right and left handed cutting. It's curved handle design allows for even pressure while making clean cuts. It features a secure locking blade guard for safe usage and storage.